This was an interesting but very fun race! The course was a 1.88 mile loop around Edwin Warner Park that we had to go around 14 times (the first time being slightly shorter) to complete the 26.2 marathon distance. That meant, with our four person team, two people had to run it three times and two people had to run it four. Team Aching Bad (ah, my love of punny team names!) consisted of Amanda, my friend Jessica, and my coworker Jeff. 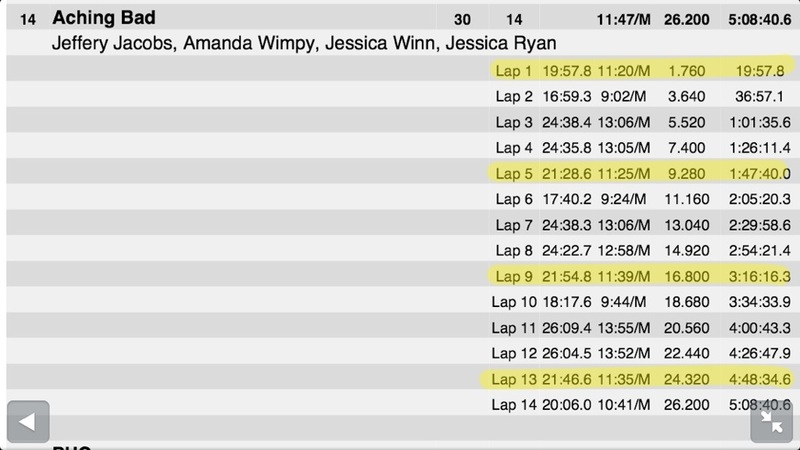 Amanda and Jessica are about on the same level running-wise. I’m a little speedier than them, and Jeff is a little speedier than me. Being one of the two fastest (lol), that means I was one of the lucky four time runners! I did get to do the (only slightly) shorter first lap, so my total official mileage for the day was 7.4 miles. The most I’ve ever run in one day! For the first lap, we started about what looked to be a hundred feet in front of the start line, but “officially” was about a tenth of a mile ahead. (I will note that my Garmin did not detect that much of a difference so my watch average pace for the first lap is noticeably different from my official average pace.) The horn sounded and we were off! The first half of the course is pretty much entirely uphill. The second half is downhill with some flats. The first half is awful. Thankfully, they positioned a water station at the top of the hill, which I took advantage of every single lap. I felt pretty speedy on the first lap. I ran up much of the hill. (I did walk a few times…that thing was steep!) Then I flew downhill. I had a quick pause on the flat to catch my breath and ran to pass the baton to Jeff, who was running after me. Below is my pace graph for the first lap, where you can see elevation too. The slowdown at the very end was due to me forgetting to turn off my watch! I think everyone on our team had about a similar first lap experience: horror at the gigantic hill and a joyous downhill run. It seemed like my second lap came before I knew it! It was a lot tougher. I walked up more of the hill and more on the flats. The third was even harder. By then, it was getting closer to mid-day and the sun was bearing down on us. The temperature had risen nearly twenty degrees since we started. I was trying to psych myself up for the final lap. Amanda promised me three Fig Newtons from the food station if I did it in 20 minutes. For every minute slower, I would lose a cookie. I pushed as hard as I could and did it in 21 minutes. I got two Fig Newtons (and some crackers and a banana). All in all, we finished our marathon in a little over five hours. So we’re not going to qualify for Boston anytime soon, but it was a blast (except for that hill). Garmin says the average pace for my first lap was around 10:18, and Strava reports my fastest mile was 8:48! I would say all that speed training has helped, but I’m sure a lot of that has to do with gravity. I know downhill running can destroy your quads, but my hamstrings were what was mostly sore the next day, so my downhill form must not be too terrible. But super good news: no hip pain at all! 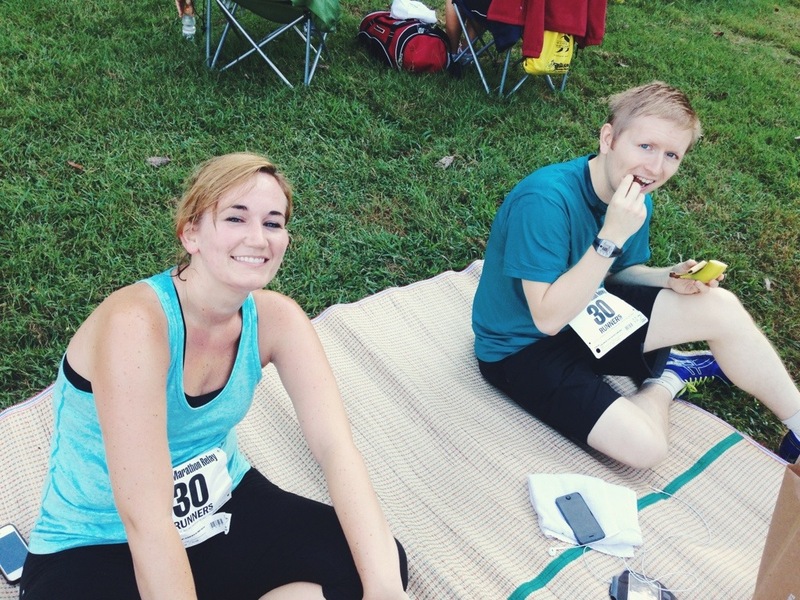 I’m not quite ready for Ragnar yet, but relays are FUN! 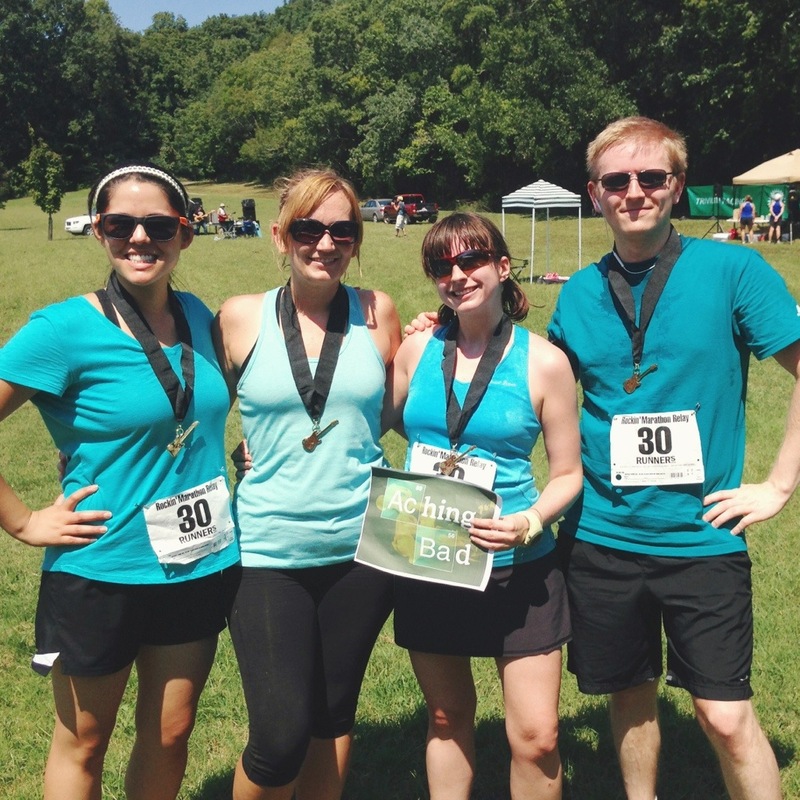 This entry was posted in Race and tagged relay, rockin marathon relay, running with friends. Bookmark the permalink.